Samsung is one of the leading Smartphone Producer, One of the Best Series in Samsung Smartphone are Samsung Galaxy which Runs on Android Operating System. Samsung Galaxy S3 is powered by Android 4.0.4 Ice Cream Sandwich Operating System with 1.4GHz quad-core application processor. As compared to S2, Samsung Galaxy S3 is much slimmer and faster Smartphone. –> Smart Stay :- Phone Keep track on your eyes, so as long as you’re looking at it, the display won’t dim or turn off. –> Smart Alert:- This will Alert you if you have any Missed Call by vibrating Phone when you pick it up and flash an LED. –> Direct Call:- Auto-dial a contact if you have their contact details or a message. —> S Beam:- It get automatically pairs with other Galaxy S III phones via NFC so you can easily shares photos, videos or files over Wi-Fi. –> Eye-tracking:- This feature recognizes your eye movement while you use the phone. 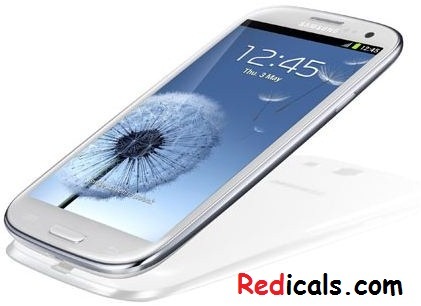 Samsung Galaxy S3 comes with Super AMOLED HD 16M Display screen. The size of the screen is 4.8 inch capacitive multitouch screen with resolution of 720 x 1280 pixels, 4.8 inches (~306 ppi pixel density) and TouchWiz UI v4.0 and Corning Gorilla Glass 2. Samsung Galaxy S3 comes with1.4GHz Exynos 4 Cortex-A9 quad-core processor chips which helps you to do multiple tasks simultaneously. This Processor Helps to run HD games and Video more smoothly. It also has 1GB RAM and Graphics Card(Dual Mali-400MP GPU ) which Helps to run HD games and to watch 1080P videos on YouTube . Samsung Galaxy S3 comes with 8 MP rear camera and 1.9 MP front camera and has LED flash ,Autofocus. Camera Comes with Amazing features like Best photo, Buddy photo, Burst shot,Face zoom, Face slideshow, Facial recognition,geo-tagging, touch focus, smile detection, image stabilization etc. Browser:- HTML, Adobe Flash 10.1 higher for playing flash and can play facebook games. Battery:- 2100 mAh for lasting long battery life and also wireless charging extra.